Right supraglottic soft tissue (upper part of the larynx, the area above the vocal cords) prominence raises the possibility of a tumour. Bilateral supraclavicular and superior mediastinal nodes are in keeping with metastatic nodes. The largest seen on the left measuring 3.5 cm. YHC underwent chemotherapy. The first cycle of chemo almost “knocked” him off. The side effects came six days after the treatment. He had to be hospitalised because of fevers, vomiting and diarrhea. Because of this the oncologist reduced the dosage of the subsequent chemo. So YHC went through the second to sixth cycles of chemo without any problem. However, after the sixth chemo, YHC had to be hospitalized again due to pneumonia. He was in the ICU for a week and this treatment alone cost him RM 30,000. The prominence of the right supraglottic soft tissue is reduced when compared with the previous scan. Bilateral supraclavicular enlarged nodes are partially regressed. A small pericardial effusion is present. There are confluent nodes in the mediastinum which compress the superior vena cava. There are also confluent right hilar nodes. The approximate size of the confluent nodes is 6.4 x 4.8 x 3.7 cm. There is mild thickening of the gastroesophageal wall. There is further regression of prominent right supraglottic soft tissue. Bilateral supraclavicular modes are still present. The anterior mediastinal soft tissue mass due to confluent nodes is smaller, measuring 4.2 x 3.4 x 3.3 cm. It still compresses the superior vena cava. Confluent right hilar nodes also appear smaller. There are discrete nodes overlying the aortic arch which are also slightly reduced in size. 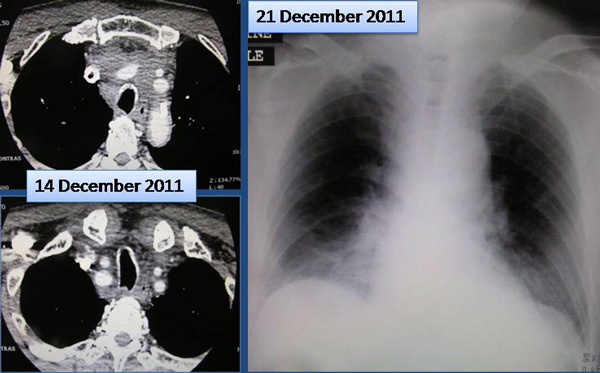 There is a new finding of bilateral pleural effusion, larger on the right, associated with right lung basal ateletasis. There is also partial collapse-consolidation of the right upper lobe. The mediastinal mass of confluent nodes has increased in size. The paratracheal component of the mass is 5.0 x 3.5 x 5.4 cm severely compressing the superior vena cava. The anterior mediastinal lymph nodes have also increased in size, measuring up to 1.5 cm. A right pleural effusion is noted. Impression: Bronchogenic carcinoma with mediastinal lymph nodes increased in size from the previous examination. Does this mean that after all the chemos were completed, “someone” decided that his cancer was actually a lung cancer? So, was he treated correctly in the first instance? YHC’s biopsy report was given the oncologist who later misplaced or lost it. Imagine such thing can happen in a private hospital! The second fact was just as equally baffling. Let us look at the condition of his lungs before and after the treatments. His lungs were getting worse after chemotherapy! One important lesson we can learn from this case is that shrinking of tumour or mass after chemotherapy is meaningless – indeed, it is misleading and has no meaning. Let me highlight the important points again. After the first few chemos the mass became smaller and smaller as evidenced by the CT scan. So everybody was happy – the patient was happy, his family members were happy and the oncologist was equally happy. But do we (especially those who see this happen every day) not realize through experience that this shrinking of tumour is meaningless? Experience shows that the mass would grow in size again soon afterwards. The previous gain is often lost after more chemos. Is this not what happened most of the time? 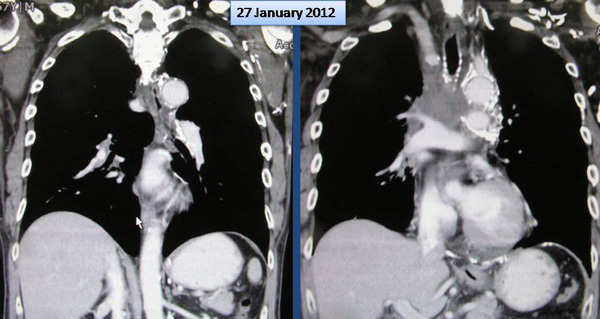 26 January 2012: Right supraglottic soft tissue is reduced in size. Bilateral supraclavicular nodes are partially regressed. 5 March 2012: There is further regression of right supraglottic soft tissue. 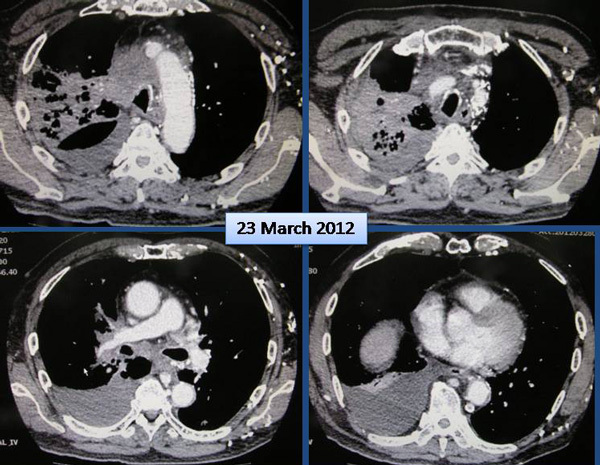 28 March 2012: The mediastinal mass has increased in size. Anterior mediastinal nodes have also increased in size. Chemotherapy did not cure him. In fact the treatment made him worse. But the doctor told YHC to continue with more chemo and radiotherapy. YHC refused further medical treatment saying, “I would have to do more and more chemo and eventually “bye, bye!” He had spent more than RM 100,000 and was not going anywhere. Even the oncologist told him, “more chemo is not going to make him better. His condition would turn from bad to worse.” Why do more chemo then? To me, the crucial point is not whether the tumour shrinks or not, but rather can the cancer be cured by the treatment. If the treatment cannot cure, then shrinking of tumour is meaningless. I would prefer to advise patients to be happy and just be contented if they feel better after the treatment rather than place their hope on a shrinking tumour that brings them nowhere. This entry was posted in Advice to Patients, Lung Cancer, Medical treatments and tagged chemotherapy, lung cancer, tumour shrinkage by CA Care. Bookmark the permalink.